Cinema has always featured heavily in Rome. In the second half of the 20th century, the city has produced some of Italy’s greatest film directors and films, but unfortunately, even in Rome, the art movies are being replaced by Hollywood blockbusters shown in huge multiplex cinemas in new shopping malls on the outskirts of the city. However, the art of cinema is not dead. Luckily, some unique places remain alive in the city centre. Film director Nanni Moretti runs a famous cinema in the Trastevere area, called Nuovo Sacher, where he is known to make a personal appearance regularly. A couple of other theatres show original language movies on the via del Corso and around. My personal favourite is Cinema Tiziano in the Flaminio area north of the city centre. Hidden in a courtyard at the back of a church, Cinema Tiziano is in itself an oddity. 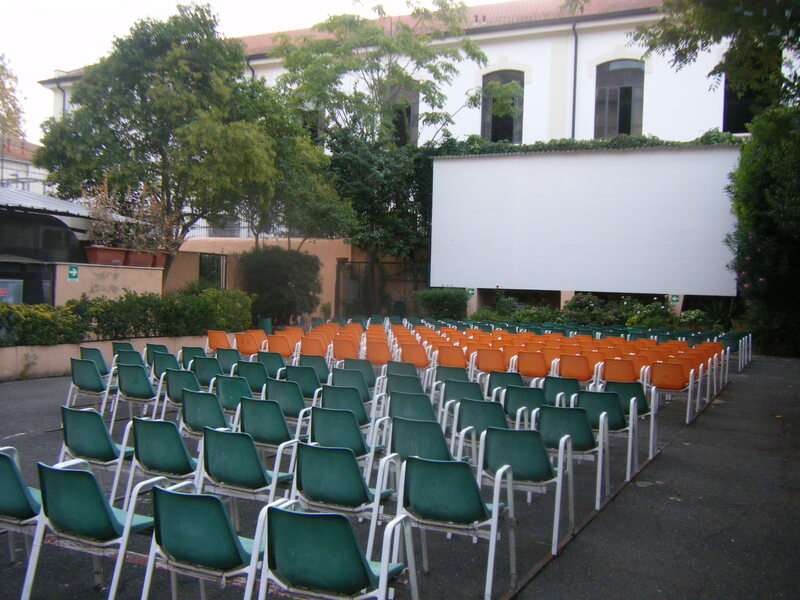 From May to September, it becomes an outdoor cinema with rusty chairs aligned in front of an old fashion screen, showing a different movie almost every night. In winter it becomes a social gathering place, where local residents meet on saturday afternoons to chat and possibly watch the movie. The place feels lost in time, halfway between Cinema Paradiso and the last of the Mohicans. Until very recently, it didn’t even get noticed, but with the opening of the Museum of Art of the XXI century or MAXXI next door, it suddenly has a very prestigious neighbour. Maybe it will make no difference to it, as we know that in Rome the old and very old can live harmoniously with the new, or maybe it will bring new life to it. As always here, everything remains unpredictable. This entry was posted on October 4, 2010 by Salambo in Arts and culture, cinema, Daily life in Rome, English, Rome's neighbourhoods and tagged cinema, courtyard, Flaminio, hidden, MAXXI, outdoor, Tiziano, via Guido Reni.